Four recent films concerning Armenia, Armenians, and contemporary issues concerning them will be part of the Socially Relevant Film Festival at the Quad Cinema in New York from March 14-20, 2014. To see the entire slate of movies, dates and times, and to purchase tickets, visit http://www.ratedsrfilms.org or call the QUAD Cinema (212) 255-2243. Orphans of the Genocide. An emotional visual journey through never before seen archival footage and discovered memoirs of orphans. Hamshen at the Crossroads of Past and Present. Dedicated to the current state of the descendants of the Islamicized Armenians of Hamshen. Bavakan. The horror of gender selection and abortion in contemporary Armenia. Founded by the award-winning Armenian actor, filmmaker and curator Nora Armani, the festival will showcase films with human interest stories and socially relevant themes as a response to the proliferation of violence and violent forms of storytelling. 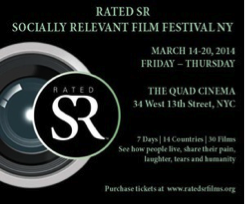 Rated SR aims to promote positive social change through the powerful medium of cinema. By raising awareness, expanding knowledge about diverse cultures, and the human condition as a whole, it is possible to create a better world, free of violence, hate and crime. Rated SR Films are enlightening, uplifting, entertaining, but most of all, artistically appealing. Over 50 narrative and documentary films will screen, including ten feature films which will compete for the Grand Prize, a week-long theatrical engagement at the Quad Cinema, courtesy of the QuadFlix Select Program, and eight documentaries will compete for the documentary prize. The winner will receive a VOD DVD distribution deal courtesy of Cinema Libre Studio, a leader in the distribution of social issue documentaries and independent feature films.